This is the Good Deed Giraffe. 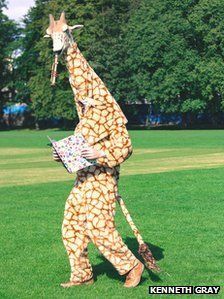 He lives in Scotland, and likes to dress up as a giraffe twice a week and perform random good deeds for strangers. He's been spotted handing out coffees to office workers, bananas and water to runners, and £10 vouchers to mums. He's also been seen cleaning up litter on a beach. The guy is unemployed and all of this is funded by his busking earnings. We've been reading about him all week, and our favourite quote comes from the BBC News website: "He hitch-hikes to reach his destinations - but is only being able to be picked up by convertibles due to his long-necked suit." Class. You are a true super-hero and we salute you, Good Deed Giraffe.